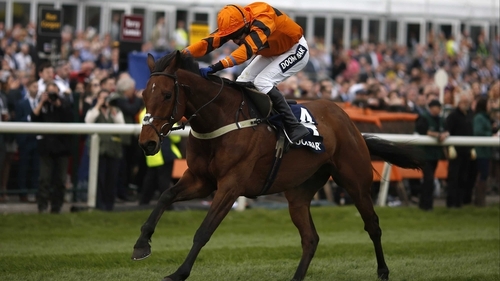 Thistlecrack claimed Grade One honours for Colin Tizzard and Tom Scudamore in the Doom Bar Sefton Novices' Hurdle at Aintree. The seven-year-old was sent off at 25-1 in the extended three-mile contest, stepping up a full mile in distance after finishing fifth in last month's Imperial Cup at Sandown. Scudamore unsurprisingly took his time, but he was still moving powerfully at the top of the home straight and he moved up to challenge Irish raider Alpha Des Obeaux jumping the third flight from the finish. Thistlecrack looked to be gaining the upper hand between the final two flight, but Alpha Des Obeaux was still in with a shout when he was asked for a big one at the last by Richard Johnson and came crashing to the turf. His exit left Tizzard's charge home for all money and he passed the post 13 lengths clear of Vyta Du Roc, with Our Kaempfer third. The disappointment of the race was heavily-supported favourite Roi Des Francs, who was being pushed along heading out for the second circuit by Ruby Walsh and was eventually pulled up. Scudamore said: "It was great, it's wonderful to ride a winner for the Tizzards. I've ridden a lot of winners for them over the years but it's nice to do it on a nice horse on a big stage. "It was a proper job. "I thought I had it won at the last, we missed it too, but as long as Dickie (Johnson) is all right that's the main thing." Johnson later rose to his feet and walked away. Scudamore went on: "Joe (Tizzard) said he was not 25-1 chance, he was fifth in the Imperial Cup last time. "It's great for Colin to have another nice horse, he'll make some chaser." Tizzard said: "He wasn't right when he was well-beaten last time we stepped up in trip at Cheltenham. He's been very good otherwise. "He's always been a good horse on our gallops. I thought he'd be better off on better ground. Ruby (Walsh) won on him at Ascot when he gave him a peach. "I was sure he would stay, his dam was a stout stayer. "He was only rated 135 so he would have been a good thing in the handicap. "We're thinking of the three-miler at Punchestown now, if he's fine tomorrow. He's a thorough stayer and travels well."